http://www.engvid.com/ Phrasal verbs are an important part of speaking English fluently. 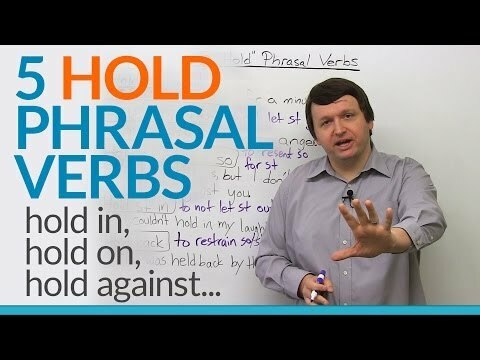 In this lesson, I look at FIVE common and useful phrasal verbs with the verb "HOLD." Hold on. Five? That's right! I don't hold back anything in this lesson. Hold onto something, and get ready to learn. You won't be able to hold in your smile as you improve your vocabulary! Click on this lesson, or I may hold it against you! www.engvid.com/5-hold-phrasal-verbs/ TRANSCRIPT Hey, guys. I'm Alex. Thanks for clicking and welcome to this lesson on five "hold" phrasal verbs. This is actually a user-requested lesson. And just a reminder: if you ever want to suggest a lesson for myself or any other engVid teacher, feel free to do so on the comment section below or look me up on Facebook. You can just look up "Alex engVid." Now, today, we're going to look at five phrasal verbs, as I mentioned, that use the verb "hold". First one is: "hold on". So let's look at the sentence: "Could you hold on for a minute?" Hmm, often this phrasal verb is used in this type of question form, it's also used as an imperative. If I just say: "Whoa, whoa, hold on". So, "hold on" basically means: wait or stop. Okay? So, generally, it means to wait. "Could you hold on for a minute? Could you slow down, or wait, or stop what you're doing?" Okay? So, often used in imperative or in a request form. Next, we have to hold onto something or hold onto someone. So if I put "st", it's something; "so" is someone. "You shouldn't hold onto anger." What do you think this means? You think of the verb "hold" and very literally, you hold onto something, it means you don't let it go. Okay? So to not let something go. So you can hold onto a person's hand or you can hold onto the railing as you're walking up the stairs somewhere. Okay? So a very literal meaning in this one. Next, we have: "to hold something against someone". So we have the sentence: "You're ambitious, but I don't hold it against you." Now, to hold something against someone means that you basically resent someone or you don't like someone because of something about their character or something they have done, so you feel badly towards someone because of something they did. So basically, to resent someone for something, for something they did or something about them. So in this situation, I'm saying: "You're ambitious", now maybe some people think, you know, ambition can be a positive thing. It can also be a negative thing if you're too ambitious and you want too much for yourself. So if I say: "Well, you're ambitious, you know, but I don't hold it against you, I don't hate you for it. I don't resent you for being ambitious". Okay? Next: "to hold something in". The sentence says: "I couldn't hold in my laughter!" So if you hold something in, this means that you don't let it out. Right? So to not let something out. Now, we often to use this to talk about laughter. You can hold in your feelings. Also, if you're going on a long car ride on the highway, you can hold in your bodily functions, so you can hold in your pee basically, that's what I want to say. So to not let something out, like hold it in. Okay? And, finally: "hold back". So the sentence says: "He was held back by the police." So think of held back by the police. Held back, hmm, this means to restrain a person from doing something. And you can hold yourself back from doing something. So to restrain someone. Okay? So you can also restrain something, like you can restrain yourself from doing something as well. Okay, so guys, just to review: "hold on" means to wait, most often used in imperative like: "Whoa, whoa, whoa - hold on, I don't understand". Or: "Whoa, hold on, go back". Or to make a request: "Hey, can you hold on for one minute?" Second, "to hold onto something or somebody", don't let it go. You can hold onto a feeling, you can hold onto something physical, you can hold onto an emotion. Okay. Feeling, emotion - same thing I suppose. "Hold something against someone", like you are angry at a person because of something they did in the past and you can't let it go. Okay? "Hold something in", to not let something out. "I couldn't hold in my laughter the movie was so funny", or: "the joke was so funny". And "to hold back" is to restrain yourself or to restrain someone or something from doing something. So, if you want to test your understanding of these five phrasal verbs, as always, you can check out the quiz on www.engvid.com. Don't forget to subscribe to my YouTube channel. And again, if you have any suggestions for future lessons, please leave them in the comment section below. And I'll see you guys next time. Bye. "I couldn't hold in my laughter the movie was so funny"